Many of us are in the midst of our post season break or even getting ready to start our block of winter base training. Base training in the winter can result in some long solitary hours on the bike during a time when we are subject to some pretty lousy weather conditions. For some of us, we live in places where a long ride can take us through several different weather patterns and temperature variations, so how do we stay dry and warm through all that? The pros find a way to deal with inclement weather to accomplish their off season base training, so how do they do it? Growing up in southern California, I never had to worry much about winter gear outside of a vest, arm warmers, and gloves. However, after moving to Europe and now Colorado, I have gained an appreciation for having the right gear to handle the weather conditions. Obviously southern California doesn’t require the same type of clothing that you may need to handle the blustery winters in Colorado or northern Europe where fleece lined everything is needed. Give some thought to where you live and the winters you typically have and don’t hesitate to drop by your local bike shop to ask for some clothing tips for the winters in your area. Don’t go cheap on clothes, often times you get what you pay for when it comes to clothes. Unless you’re dealing with heavy duty winter gear, most cycling gear is going to appear thin and light and that’s the point. It will often be thin to make it more easily layered upon, yet will still insulate well. Making clothing of that nature isn’t very cheap, so don’t hesitate to spend a few extra dollars for some good clothing. One of the most basic tips is to layer your clothing so that you can always add and remove clothes as you go. Being able to open up or pull off an article of clothing when you are climbing will keep you from getting sweaty which will in turn keep you from getting too cold once you start descending. Many clothing companies recognize the importance of this and are continually expanding on clothing pieces that encourage layering. Consider starting with a base layer and adding the appropriate clothing from there. In colder climates, you may want a fleece jersey, however in climates where it’s likely to warm up during your ride, you may want a lighter jersey that doubles as a summer jersey. From there consider layering with a thermal jacket or even just a vest and arm warmers. What’s the use of layering if you need to take off half of what you have on at some point and where do you put it all? This is where mastering the art of tightly rolling your clothes and being creative in storing extra gear comes in to play. When shedding clothes or even bringing extra clothes on your ride, fold the edges of any large garments in towards the center of the garment leaving the top and bottom of the garment unfolded till you have a 3-6” wide strip of clothing. Then roll the garment tightly like a sleeping bag and tuck it into a pocket. What do you do if your pockets are full? A favorite place for me to tuck large rolled up garments is under the Y of my my bib short straps on my back. This keeps pockets free for smaller things you may want to have more readily accessible. If you live in an area where rain is a constant threat to your training, always have some rain gear ready to throw in your jersey pockets on your way out the door. Nothing will ruin your ride like getting drenched to the bone, especially if it’s a cold day. All you need is a simple thin waterproof jacket to keep you dry. If you’re layering properly, you won’t need to rely on your rain coat for added insulation, so keep it simple. You want your rain jacket to roll up small enough to avoid being a hinderance to carry on your ride. If anticipating a long wet day, think about throwing some waterproof shoe covers on, along with some water resistant gloves. Try to stay as dry as you can for as long as you can when you know getting wet is going to be inevitable. Sometimes we can’t help but get caught off guard by the occasional rogue storm, in which case we have to use our McGyver skills to make do with what we’ve got. A good place to take tips from in these scenarios are the pro peloton. Racers try to travel light during races and can be at the mercy of weather patterns on the course. You’ll often see pro’s grabbing newspapers at the top of major climbs and tucking them in the front of their jerseys for the descents. The newspapers act as a windbreaker for them and helps keep their core from significantly cooling down on the descent. Some other creative ideas I’ve seen are cutting arm and head holes in a trash bag and using that as a rain cape and throwing some plastic sandwich bags over your socks when caught off guard by rain. All these things can be purchased or begged for at most any convenience store along your ride route. 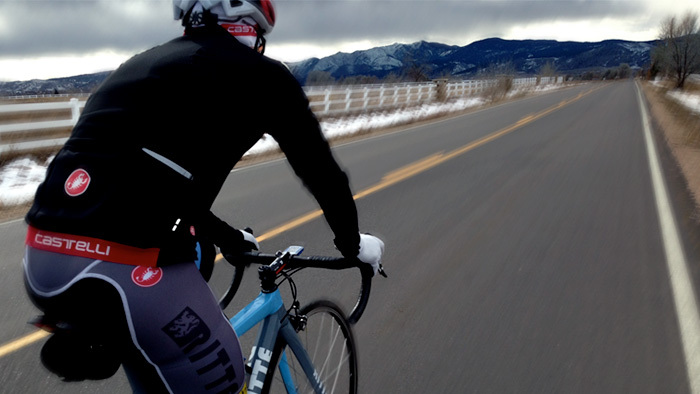 The winter months can be a tough time to stay motivated to get out and ride consistently. Dressing to stay dry and warm will keep the discomfort of the cold at bay and keep you able to get out there day in and day out. Those winter miles will set the foundation for a great season, so make sure you don’t let the weather beat you this winter.